This work explores the creation of quantifiable indices to monitor the safe operations and movement of families of autonomous vehicles (AV) in restricted highway-like environments. Specifically, this work will explore the creation of ad-hoc rules for monitoring lateral and longitudinal movement of multiple AVs based on behavior that mimics swarm and flock movement (or particle swarm motion). 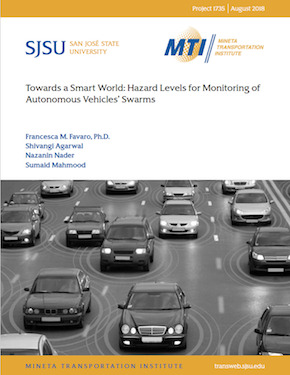 This exploratory work is sponsored by the Emerging Leader Seed grant program of the Mineta Transportation Institute and aims at investigating feasibility of adaptation of particle swarm motion to control families of autonomous vehicles. Specifically, it explores how particle swarm approaches can be augmented by setting safety thresholds and fail-safe mechanisms to avoid collisions in off-nominal situations. This concept leverages the integration of the notion of hazard and danger levels (i.e., measures of the “closeness” to a given accident scenario, typically used in robotics) with the concept of safety distance and separation/collision avoidance for ground vehicles. A draft of implementation of four hazard level functions indicates that safety thresholds can be set up to autonomously trigger lateral and longitudinal motion control based on three main rules respectively based on speed, heading, and braking distance to steer the vehicle and maintain separation/avoid collisions in families of autonomous vehicles. The concepts here presented can be used to set up a high-level framework for developing artificial intelligence algorithms that can serve as back-up to standard machine learning approaches for control and steering of autonomous vehicles. Although there are no constraints on the concept’s implementation, it is expected that this work would be most relevant for highly-automated Level 4 and Level 5 vehicles, capable of communicating with each other and in the presence of a monitoring ground control center for the operations of the swarm. Dr. Francesca Favaro is an Assistant Professor in the Department of Aviation and Technology in the College of Engineering at San Jose State University. Prior to joining SJSU she earned a PhD and MS in Aerospace Engineering at the Georgia Institute of Technology, and MS and BS in Space Engineering at Politecnico di Milano, Italy. Dr. Favaro research interests lie in the broad field of system safety and risk analysis, with an emphasis on system engineering concepts and the safe integration and embedding of new technologies and the consistent update of regulations and certification practices. In 2016 she founded the RiSA2S lab, which deals with Risk and Safety Assessment of Autonomous Systems such as drones and self-driving cars. In 2017 she became a research associate of MTI and started collaborating as expert in the realm of autonomous vehicles. Her interests are currently focused on the safe integration of autonomous systems within US public roads as well as the National Airspace. She particularly focuses on bridging the gap between the technology world and the current regulatory panorama. Dr. Favaro has authored several journal publications and conference proceedings on a variety of topics, and is currently working on a human-in-the-loop study to quantify response times and drivers’ reactions to disengagements of the autonomous technology for advanced autonomous vehicles. She has been interviewed by multiple media outlets including the Wall Street Journal, Wired Magazine, and Verge Tech forum as a leading expert in the field of automation safety. Dr. Favaro is an FAA Aviation certified Advanced Instructor, a certified Remote Pilot for drone commercial operations, and a solo-endorsed pilot. Shivangi Agarwal, Nazanin Nader, and Sumaid Mahmood are all students at San José State University.